We've created this informational site to educate our stakeholders on this project. Check back for the latest information as it develops. MRED Preferred Unit Owners have a direct link to management and a major say in the future of the MLS. If you would like to become a PUO to more directly participate in discussions regarding Upstream, click HERE. Tom Salomone, Real Estate II, Inc.
Dana Strandmo, HomeServices of America, Inc.
Upstream is a collaborative broker initiative designed for brokerages of every size, and a comprehensive data management project for the benefit of the real estate industry. It's more than a mechanism for brokerage data entry, management, storage, and distribution, Upstream is the culmination of an industry groundswell to take back control of brokerage data. It enables innovation by allowing brokerages to manage their data assets through a simple, streamlined platform. The ability to deliberately distribute data to third parties. Brokers determine which vendors get access, which data elements they independently receive and the frequency the data is available. It puts control back in the broker's hands and allows them to determine the exchange rate for access to their data. The ability to work with new, innovative companies more readily that may require their data (especially listings) across their offices regardless of MLS boundaries. Google Drive provides a great analogy how Upstream will work, who has access to the data and how the platform will evolve. Everyone can optionally leverage Google Drive. A file owner can permit access to specific files, multiple files, or entire directories. As the owner, they can revoke or change access controls at any time. No one at Google has access to your files, Google doesn’t modify or distribute your files and Google doesn’t sell access to your files. It simply offers the ecosystem that empowers the file owner. Brokers determine who has access, what can be accessed and when data is available. Upstream, and its technology vendor will NOT have access to your data without your explicit permission. WHAT IS THE GOAL OF UPSTREAM? The initial goal of Upstream was to have a single Add/Edit platform where all subscribing brokerages will enter their properties for sale. From this platform, the data feeds would then flow to the MLS databases where the brokerages have MLS subscriptions, as well as be the platform for brokerage syndication choices, feeding back-office systems and, eventually, vendor products. Upstream data distribution is a lot like ListHub in that it will only send individual brokerage data where the individual broker wants it to go, on an opt-in basis. Aggregated data or opt-out agreements will not be executed by Upstream. This means that products like CMAs, statistics, or IDX will not connect to Upstream. Upstream has entered into an agreement with RPR (a wholly owned subsidiary of NAR). NAR is providing $12 million in initial funding, and RPR will provide the technology for the Upstream project. Upstream’s tagline is “The Single Source of Truth” and it will be marketed as a member benefit of the National Association of Realtors. WHAT IS THE IMPACT ON MRED? Implementing Upstream is a significant change to MRED's MLS system and business processes. Expenses relating to this change would most likely result in an increase in MLS access fees. Maintaining the superior quality of our data is paramount. Part of this process is insuring our data standards are not impacted. Anything that has the potential to diminish or delay data in the MRED system is something that needs to be fully evaluated. The technical requirements of this project for MRED's MLS vendor, dynaConnections, are substantial. However, dynaConnections has assured MRED that its existing product roadmap for connectMLS and related initiatives will not be affected by the implementation of the Upstream project. 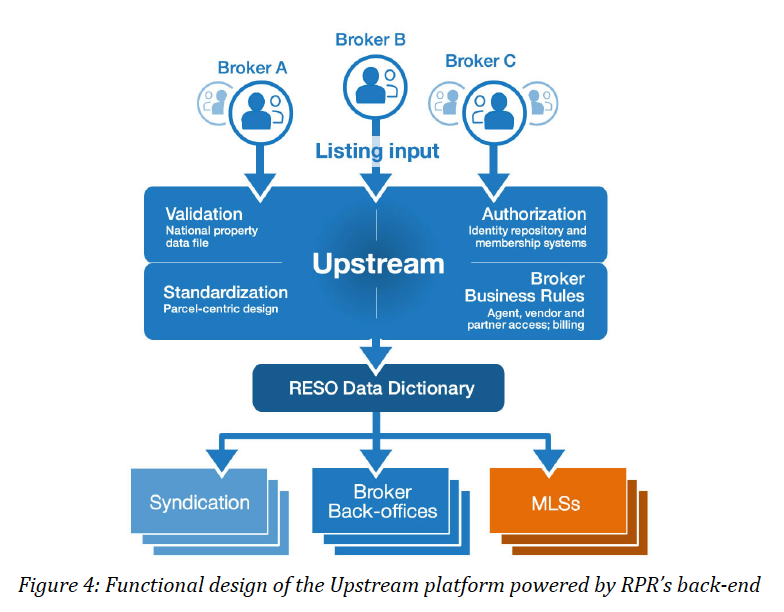 Upstream would need to fully implement MRED’s listing input business rules and processes so that the data in the MLS is not negatively impacted. Any changes to MRED’s rules in the future would need to be coordinated with Upstream. Once a brokerage decides to use Upstream, the add/edit functionality of the MLS system would be disabled; the only way to input listings for participating brokerage firms would be through Upstream. MRED staff would be responsible for policing listing data submitted to Upstream to ensure its accuracy and adherence to MLS policies. We would need to hire additional full time employees in rules and regulations because of the increase in workload associated with policing listing data in this new system. The degree to which the Upstream system integrates with MRED systems will impact staffing requirements. If significant manual compliance is necessary, MRED will need more staff than if Upstream can integrate with MRED’s internal systems. MRED staff does correct inaccurate data input into certain fields. Once the correction is made, staff will notify the Listing Office and Agent of the correction via the connectMLS's Listing Validator Notification system. Upstream has requested a full roster list of all MLS customers; this would be a departure from current MLS practices. Any costs associated with implementing Upstream technology or additional costs associated with increasing MLS staff to support this system would be paid fully by MRED. This will likely result in an increase in MRED MLS access fees. A number of unanswered questions remain, which would greatly impact the scope of this project. See the list of questions MRED has submitted to UPSTREAM HERE. UPSTREAM has announced that Alex Lange has been named the company's first President and CEO. See the press release HERE. Initially led by the Realty Alliance and Leading RE, Upstream’s support is increasing and includes a number of MRED brokerages. Combined, known support of brokerages comprise a significant portion of MRED’s market, totaling 35.85% of active agents, 39.38% of active listings, and 40.21% of transaction sides. An official survey has not been sent to all MRED firms. At this point, support is only reported based on one-on-one conversations between MRED President/CEO Rebecca Jensen and firm owners, and emails of support that MRED has received. At the 2016 NAR Midyear Legislative Meetings in Washington D.C., representatives from Upstream announced five markets that have been selected for the Phase One Pilot Market process targeted to begin Q3 2016.